Tata DOCOMO, the GSM arm of Tata Teleservices Limited has announced that the Video Call and Data charges for its 3G mobile services (3G Life) in 9 telecom circles in India. The 20 cities where Tata Docomo 3G Service is currently live are Karnataka, Kerala, Madhya Pradesh-Chhattisgarh, Rajasthan, Gujarat, UP (West), Punjab, Haryana and Maharashtra-Goa. 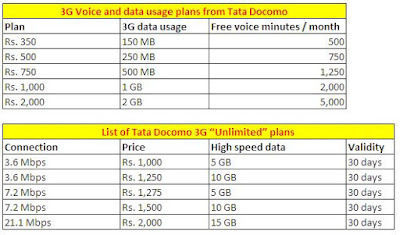 Tata Docomo’s basic 3G Video Call charges will be 5p/second while the effective voice call cost will just 0.66 paisa per second (approx 40p/min with bundled offers) while the Data Services are priced at 1 Piasa per KB of Data Transfer irrespective of whether in local/national or roaming network. 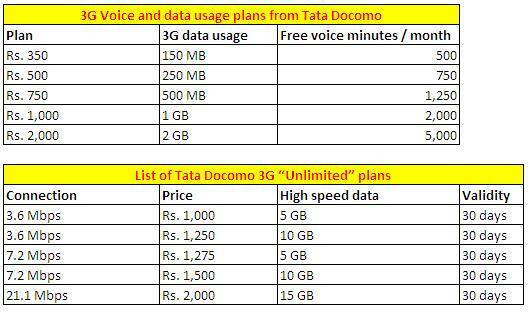 TATA DoCoMo 3G is now offering 100 MB Free Data Usage with every New 3G Connection/ 3G Recharges done upto 31st December. In addition, VAS Services like Mobile TV, High Definition MultiPlayer Gaming Services among others have been launched by DoCoMo under it’s Dive-In brand.